Higher top higher bottom or lower top lower bottom is the most significant principle of Dow Theory. In lay-man terms it says that you should never exit your long positions in an underline asset if the asset is making higher highs with higher lows in a bull market or vice-versa. 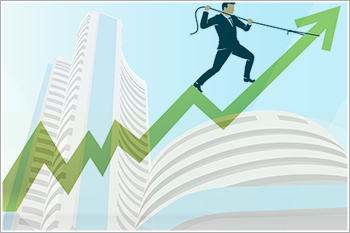 Benchmark indices are often hitting lifetime highs in 2017, and there have been many occasions when the markets have surged and dipped creating instances which have lured the investors to take a call on their positions. A key tool that aids investors in such scenario is the Dow Theory. An investor who took positions during the Bull Run, in a state of panic, gave up their positions when the indices saw the marginal correction. In many instances, it might be a marginal correction and investors end up booking loses. If an investor follows Dow Theory such scenarios could have been avoided and could have taken a calculated call till it follows the guidelines prescribed under this theory. Always follow Dow Theory: Higher top higher bottom or lower top lower bottom is the most significant principle of Dow Theory. In layman terms, it says that you should never exit your long positions in an underline asset if the asset is making higher highs with higher lows in a bull market or vice-versa. Let’s take an example of Nifty: Since the beginning of this dream bull-run from December 27, 2016, Nifty index has been continuously trading in a higher top higher bottom structure. It has never managed to breach its lower low and has constantly breached its higher highs. A trader following this theory would have been able to capture the entire up-move, instead of exiting his positions during the marginal corrections in the index. We can clearly see from the above chart that the underline price is trading in a strong higher top higher bottom chart structure with every dips getting bought into. The index came very close to breach its higher low of 9685.55 made on August11, 2017, but it managed to post a swift recovery after testing an intraday low of 9687.55 on September 28, 2017, and again breached its lifetime high of 10178.95, and remained in a higher top higher bottom chart structure which validates the Dow theory. Dow theory say’s if the underline assets are trading in a higher top higher bottom chart structure and the price negates the upward momentum by making a lower high and a lower low, only then the long positions should be exited.